Happy New Year – and if you’re back to work on the 2nd, then it is a very happy time. The sky this month is at its best just before dawn, so, if you’re up and about a little before seven o’clock, take some time to have a gander (makes a change from turkey!). Looking low down to the south-east, just where the glow of the rising Sun is beginning, you should easily spot Venus shining brightly enough to be mistaken for aircraft landing lights. To the right and higher is the distinctive star Spica and above it Arcturus, the brightest star in this part of the sky. Just to the left of Spica, you may be able to see Mars, although this will be tricky as it is a long way from us right now and not so luminous. Look out for its orange hue. Next in line, to the right, is a crescent Moon and then the largest of our planets, Jupiter. Now, you may have noticed that all these planets and the Moon are forming a straight line across the sky. This is the ecliptic and is the track of the Sun against the background of the heavens. It passes through all the constellations of the Zodiac. 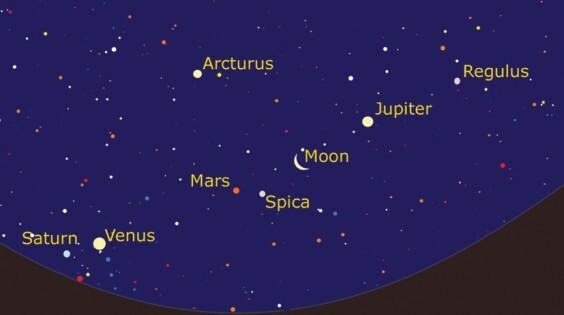 For example, we have Mars and Spica sitting in the constellation of Virgo and to the right of Jupiter is Leo, dominated by its brightest star, Regulus. If you’re a regular early riser, you may notice that the stars and planets drift westwards on a daily basis – but with two exceptions. Obviously, the Moon steps eastwards as it orbits the Earth and after five days it is a very thin crescent, very close to Venus, which is the other object to defy the westward movement. It appears to remain stationary as the stars move behind it and, indeed Saturn moves very close on the morning of the 9th, so even if you’re not usually out and about this early, this will be a good day to make the effort and go sky-watching. There is another reason too, but this needs a little extra effort. For the first couple of weeks of January, comet Catalina is passing close to the Earth and might be visible at this time of the morning. It starts the month right next to Arcturus and moves northwards daily until on the 15th it is overhead, near the end of the handle of the Big Dipper. You will need binoculars but it will be worth a go because Catalina looks like being the best comet for some time. So go on, get up and start the New Year with a bit of astronomy.